The Char Broil 3 Burner Grill Review And Rating – Is This Quickset 3-Burner Gas Grill Worth A Second Look? There’s nothing like getting outside and firing up the grill. And when there is great value in both features and price, it gets even better. The Char Broil 3 Burner Grill in the Quickset family is a solid entry to the world of LP gas grilling goodness. Char Broil has been innovating outdoor cooking for over 65 years and is America’s top selling gas grill brand. Along the way, they have listened to you and learned about the features that you need to let you start grilling with confidence. Many of these features are included on the Char Broil 3 Burner Grill like producing even heat across all three tube burners. One Touch Start ups. Easy to clean porcelain coated cooking grates. A warming rack, for when you need additional space or for keeping your food warm. And a piece of mind with a 5-year burner warranty. They’ve also added some handy features around the cooktop. Large metal side shelves and a lidded side burner that is ideal for warming up sauces or cooking side dishes. Two wheels to make moving it around easy. The Char Broil 3 Burner Grill delivers all the features you need to bring the flavor to your next cookout. All of this combines to make this Char Broil Quickset Grill the perfect space saving family grill that packs a powerful punch without putting a dent in your wallet. 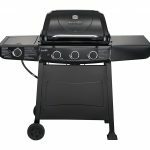 This Char-Broil Quickset 3-Burner Gas Grill with side burner is another budget friendly LP gas grill that made my list of best low-cost propane gas grills of 2017. As an innovator in the arena of gas grills, Char Broil is one of the leaders at offering low to mid-range prices, clever outdoor cooking designs and top-notch customer service. Being one of the largest BBQ suppliers in the world, Char Broil is considered a low-cost alternative to high-end brands such as Weber. cooking area, it is ideal for slow cooking. It features three stainless steel tubular burners that produce 36,000 total BTU’s of heating power. These powerful burners heat up quickly so there is little downtime. The cooking grates are made from porcelain-coated wire along with the warming rack and include a durable porcelain steel lid and firebox. All three burners have independent temperature controls, and grill is started by the Piezo push button ignition system. The cart also offers hidden room for a propane tank. In addition, a 12,000-BTU lidded and flush-mounted side burner is ideal for warming sauces or cooking side dishes. The opposite side shelf provides additional workspace and the 6-inch plastic wheels let you move the grill easily. A built-in lid-mounted temperature gauge lets you keep track of pre-heat status and monitor the inside temperature of your grill. 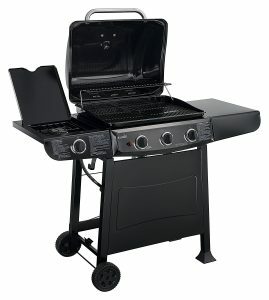 One of the most popular entry-level propane gas grills on the market today is the Char Broil Quickset 3 burner grill. Just looking at the ratings and the price, this grill looks like a decent buy. The heat output produced is good if not great for a grill of this size. However, the truth is, in many tests, this grill produced uneven cooking results when it comes to heat distribution. There is also the fact that low-grade stainless steel doesn’t do well in outside conditions and many of the components on this grill fall into this category. The cooking surface is made of thin steel and will start to bow after a while. The stand design is cheap and flimsy and the side shelves won’t take that much weight. There is a reason entry-level grills like this are considered “disposable” grills. They are not built for the long haul. You can certainly squeeze a few more years out of this grill with attention to maintenance and a little TLC. Keeping it clean and properly covered always go a long way in prolonging the life of any grill. With that being said, the Char Broil 3 Burner Grill has received many positive comments and feedback from its owners at Amazon.com. It has close to 1,000 reviews on Amazon alone and is currently rated 3.9 out of 5 stars. In all fairness, its owners have also voiced some negative reviews. I have also seen complaints about it being cheap and flimsy, warping cooking grates and low-grade plastic wheels. 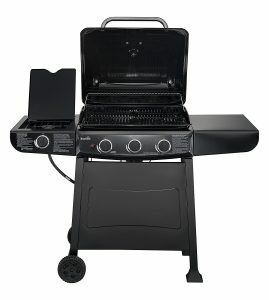 According to a lot of feedback from people who have used this grill for several years, assembly was very simple right out of the package, the grill lights easily and heats up quickly. They love the ease of use and there is a lot of talk about there food tasting great and cooking evenly. If you are comparing this grill to an $800 top brand option then you will be sorely disappointed. But compared to a no-name brand you can find in front of most hardware stores today, this grill will exceed expectations. Finding an inexpensive grill that cooks well and will last for a few seasons is not easy. It is important to remember this when looking at grills in this low-cost price range. If you are in the market for something that will last you for a decade or so, then this grill is probably not the right one for you though. 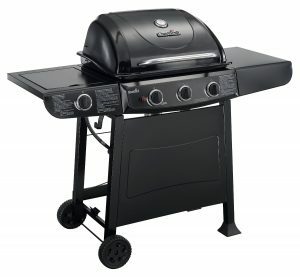 However, if you are on a budget and want a decent low-cost grill that will do its job, then the Char Broil 3 Burner Gas Grill with side burner may be worth a look. Overall, I recommend this grill as a good choice the price but do not expect the same quality that you would get from a grill in a higher price range. This grill serves as a solid choice for consumers and has the ratings to back it up. 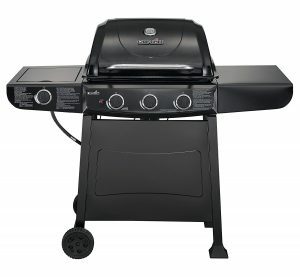 Although there are some issues with most low-cost grills like this one, Char Broil manages to include a little more quality than most other brands in this price range. Purchase and use a cover to prolong the life of this grill. Purchase cast iron cooking grates to replace the standard grates. 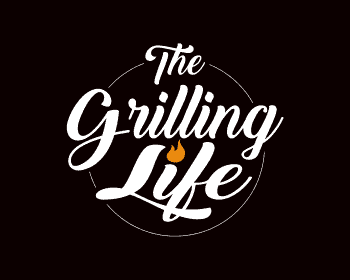 As always, if you or someone you know is in the market for a new LP gas grill or you find this information useful, please consider sharing it with your grilling friends or on social media! If you would like to leave a comment or have a review of your own to share on the Char Broil Classic 4 Burner Grill, please do so below. We always welcome your input. *This rating is based on comparable gas grills in the low-cost, entry-level price range. This rating is not meant to be compared to mid-range or higher gas grills.